We are glad you came to visit. Access the links at top and under "Connections" at right to find out more about graduate education at Temple University. Whether you are in the initial stages of considering graduate schools or are presently enrolled in a degree program at Temple University, you have embarked on the exciting next leg of your life adventure. May the road to an academic career, profession, or other life path be smooth. The Graduate School oversees all facets of graduate education at Temple University. It is responsible for admitting students who meet university requirements and recommending to The Board of Trustees the awarding of graduate degrees. The Graduate School also reviews the qualifications of those faculty members appointed as "Graduate Faculty." In addition, the Graduate School oversees the quality of new and continuing graduate programs, monitors standards of scholarship, maintains student records, and verifies advancement to candidacy. In concert with the Graduate Board, the Graduate School establishes and maintains admissions and degree requirements in consultation with the deans of the schools and colleges and their graduate councils. Finally, the Graduate School administers policies established by the Graduate Board and Temple University. 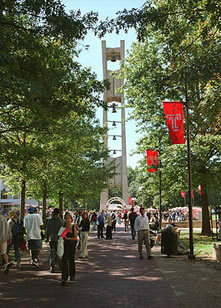 Temple University is the 26th largest university and one of the most diverse and comprehensive public research institutions in the United States. It is this nation's fifth largest provider of professional education, including dentistry, law, medicine, pharmacy, and podiatric medicine. The University’s location in Philadelphia is a key element in forging a unique student experience. As the fifth largest U.S. city, the “City of Brotherly Love” is a great place to be when books are put away and it's time to play. Temple has grown tremendously since its founding by Dr. Russell H. Conwell in 1884. Chartered as Temple College in 1888, it was incorporated as Temple University in 1907. Then, in 1965, by the Act of the Legislature of the Commonwealth of Pennsylvania, Temple University became a state-related institution in the Commonwealth System of Higher Education. Temple was designated one of only 99 public and private universities in the nation as a “RU/H: Research Universities (high research activity)” by the Carnegie Foundation for the Advancement of Teaching in its 2010 classification. Through various schools and colleges, the University offers more than 200 master’s and doctoral degree programs. Ours is a comprehensive public research university with a total student enrollment of more than 38,000; more than 5,000 are graduate students. We offer our programs at four regional campuses, including Main Campus, the Health Sciences Center Campus, and Center City Campus in Philadelphia, as well as at a major suburban campus at Ambler, PA. We also operate an education center in Harrisburg, PA, and maintain international campuses in Tokyo, Japan, and Rome, Italy. Research is central to both master’s and doctoral programs and provides faculty and students with opportunities to contribute to the development of new knowledge. Faculty members’ research and other creative activities stimulate intellectual development and prepare graduates for a wide range of careers. At Temple University, opportunity abounds for students and faculty to engage in research and creative work. Because research is such a high priority at the university, a stimulating, supportive environment is fostered.